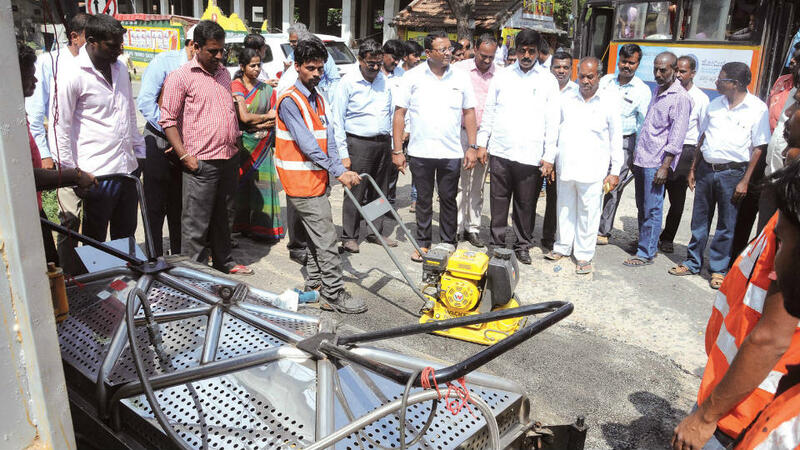 Mysuru: Pune-based company ‘KAM-AVIDA’ Enviro Engineers (P) Ltd., today presented a demonstration on pothole filling with the help of pothole buster machine, near Durga Parameshwari Temple at Ittigegud this morning. The demonstration follows a request by MCC Deputy Commissioner (Development) B.K. Suresh Babu, when he had been to Pune last month on an official work. ‘KAM-AVIDA’ Vice-President (south) S. Harikumar speaking to ‘SOM’ said that each pothole buster machine along with all attachments costs Rs. 1.5 crore. The cost of pothole filling using this machine works out to be Rs. 2,500 per square metre and added that the life of pothole filling is guaranteed for 2 years. He further said that the filling is done with UK technology. MCC Executive Engineer Nagaraj Murthy said that the MCC is currently using manual method of pothole filling which costs the MCC Rs. 500 per square metre. But what is of concern is that the pothole filling is not lasting even for a year and the MCC is looking at the best technology available for pothole filling, he said and added that a decision on choosing the machines rests with the higher authorities. Mayor M.J. Ravikumar, Corporators Vanitha Prasanna, Nandeesh Preetham, K.T. Cheluvegowda and others were present. No takers for these vehicles parked behind Rajivnagar Mosque?